Jurgen Klopp’s men will take on the Bundesliga giants in the next round of the Champions League. Liverpool take on Bayern Munich in the last 16. FORMER LIVERPOOL PAIR Luis Garcia and Steve McManaman are united in their confidence that the Reds will have too much for Bayern Munich in the last 16 of the Champions League. 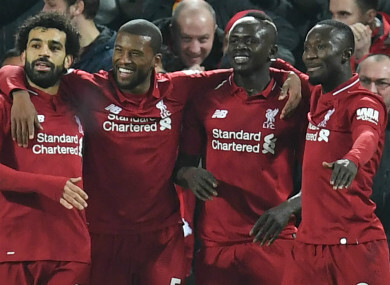 Liverpool finished second to Paris Saint-Germain – who will face Manchester United – in Group C, and that resulted in them being paired with German champions Bayern in Monday’s draw. Despite Bayern’s talent and rich history, however, Liverpool are likely to go into the tie favourites given their respective starts to the season. Bayern are third in the Bundesliga, nine points behind pacesetters Borussia Dortmund, while Liverpool – following Sunday’s 3-1 win over United – are unbeaten at the top of the Premier League. As such, both McManaman and Garcia fancy Liverpool’s chances of reaching the quarter-finals. “We were always going to get a difficult one,” McManaman told UEFA . “No disrespect to Porto, but that was probably the side you would’ve wanted. “But I thought it was fine, Bayern are not the team they once were. Not be disparaging, but they have shown that this year in the Bundesliga, that they’re not firing on all cylinders. Garcia added: “It’s not the team I would’ve picked, but if you want to get to the final it doesn’t matter. Liverpool were beaten finalists last year, but McManaman is convinced Jurgen Klopp has a strong team at his disposal, while he feels Bayern are paying the price for not transforming their entire squad after hiring Niko Kovac. “[Liverpool's team] is quicker, stronger and has that bit of added experience from last year,” McManaman said. “I think this Bayern team needed a complete revamp under their new manager, so they’re under pressure themselves, certainly because of the way they’ve started his year in the Bundesliga. Email “'Liverpool should be too good for Bayern' - McManaman and Garcia confident of progress”. Feedback on “'Liverpool should be too good for Bayern' - McManaman and Garcia confident of progress”.